Cybernoor is a leading provider and systems integrator of Oracle platform solutions. Our customers include some of the largest Oracle implementations in the world. Cybernoor is an Oracle Platinum Partner specializing in implementations, Cloud deployments and solutions, managed services, performance tuning, platform and application upgrades, and application development and integrations. 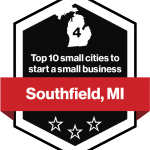 © 2017 Southfield Area Chamber of Commerce. All Rights Reserved.